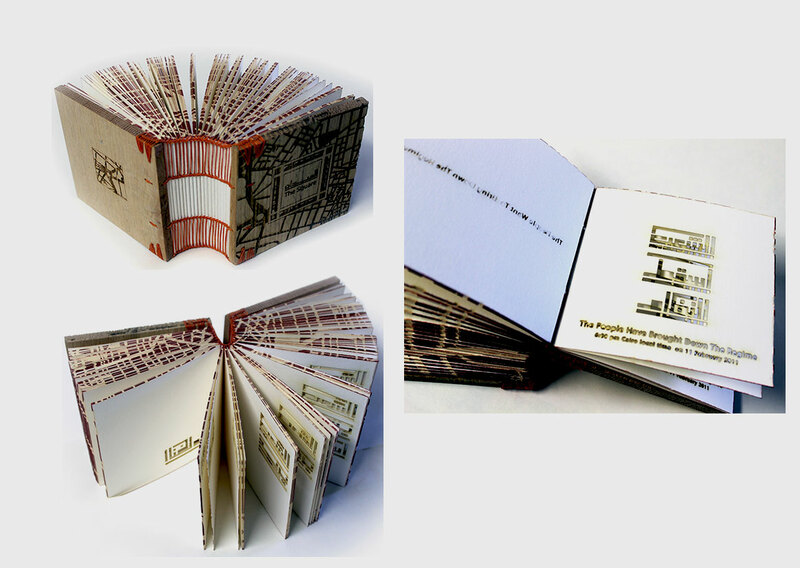 Islam Mahmoud Mohamed Aly: Using Historical Bindings in Producing Contemporary Artists' Books, Master's thesis: "I regard the culturally rich bookbinding as formats that hold great meaning; I made models of books that existed in different cultures through the history of the book. I became interested in how each structure had unique features and how the books themselves transmitted knowledge about their form. This interest in bookbinding formats led me to explore ways to add content to these historical models. The binding plays a powerful role in producing my artist's books, the look and presence of these bindings is an integral part of my work and they are linked to the content and aesthetics. The final pieces encourage the viewer to interact with the work. "I am hoping more people will learn that these historical bindings still exist and are still used in book art, and that the kind of content I use in my books will foster cross-cultural learning by making viewers learn about Islamic art and culture." Cairo, Egypt: Islam Aly, 2019. Edition of 30. 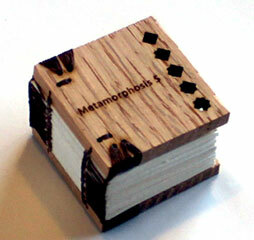 4.5" diameter x 3.5" thick; thirty sections with four folios. 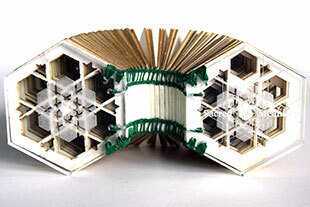 2" diameter x 0.75" miniature accordion books. Materials: laser-cut Fabriano and tracing paper, plexiglass mirror, laser-engraved wooden boards. 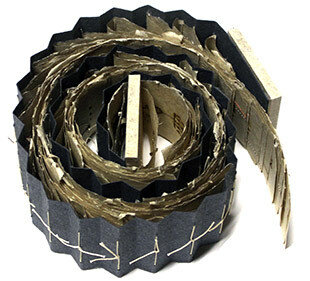 Coptic binding with leather wrappings connected to seven miniature circular books. Inkjet printed text in English and Arabic. Signed, numbered, and dated by the artist. Islam Aly: "'Inception' is inspired by stories and journeys of the immigrants and refugees. It is a bilingual codex in English and Arabic. The book is based on the twelfth-century Persian verse poem 'The Conference of the Birds' written by Farid Aldin Al-Attar. The poem is about the search for truth and integrity, which is parallel to the immigrants and refugee's quest to re-discover themselves. "Birds meet to begin searching for their perfect king. But to find him, they need to start a difficult journey. The birds show their doubts and fears to their leader, the hoopoe. He encouraged and supported the birds to be confident, grateful, and honest. The birds start a wondrous journey that only 30 of them completes, and they eventually recognize that their king is each of them and all of them. "The English text is adapted from Afkham Darbandi translation. The Arabic text is adapted from Badee Mohamed Gomaa Arabic translation 'Manteq Al Tayr'. The bird images represented are from medieval Islamic artwork. Arabic Calligraphy is done by Abdul Karim and Sabri. "'Inception' was made as part of Swarthmore College's Friends, Peace, and Sanctuary project. Major support for Friends, Peace, and Sanctuary has been provided by The Pew Center for Arts & Heritage with additional support from Swarthmore College Libraries, the Lang Center for Civic and Social Responsibility, the William J. Cooper Foundation, and the Andrew W. Mellon Foundation." Cedar Falls, Iowa: Islam Aly, 2017. Edition of 20 variants. 2.5 x 6" (42" extended); 40 Folios. Laser cut. Materials: handmade flax paper, linen thread. Handmade flax covers with modified accordion binding. Contained in circular box. Signed, dated, and numbered by the artist. Islam Aly: "Cryptic Magic is an investigation into symbols. I am fascinated with their power and how they are given mysterious attributes to represent the spiritual. Some Ethiopian scholars see the origin of writing in symbols like these. "The book is presenting a vocabulary of signs and symbols to connect the physical and the emotional. Different Ethiopian symbols are laser cut on each page, their overlapping and intersection generate new meanings. The magnets embedded in the covers and the accordion structure allows the audience to interact with the book creating different connections between the symbols and compressing or extending the structure for more sculptural appearance." Cedar Falls, Iowa: Islam Aly, 2017. Edition of 40. 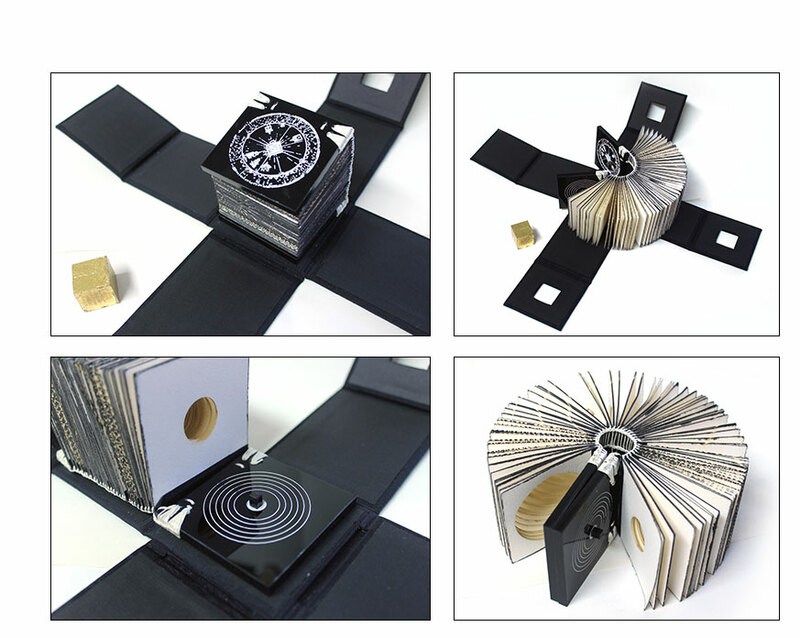 One book, 5 x 8 x 1.75", with ten sections of four folios, plus 5 miniature books attached by leather wrappings, each 1.5 x 1.5 x 0.75", with five sections of three folios. 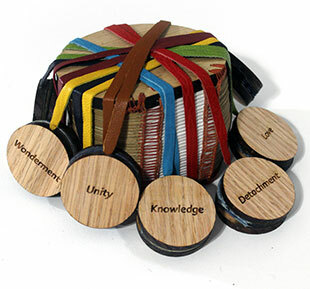 Materials: laser-cut mold-made Johannot paper; laser-engraved wooden boards. Coptic binding with leather wrappings connected to five small books. Signed, numbered, and dated by the artist. Islam Aly: "Fantastic Fauna is a bilingual book in English and Arabic, based on the tradition of having animal characteristics as caricatures of humans. The book was inspired from Ibn Al Mqufas's Kalila and Dimna, a ninth-century collection of animal fables, which came to Persia from India. Similar to George Orwell's political allegory Animal Farm, the stories are about people and politics. The animal characters were used to represent social inequality and oppression. "Fantastic Fauna shows animal images from medieval Islamic artwork that depict imaginary and real animals. 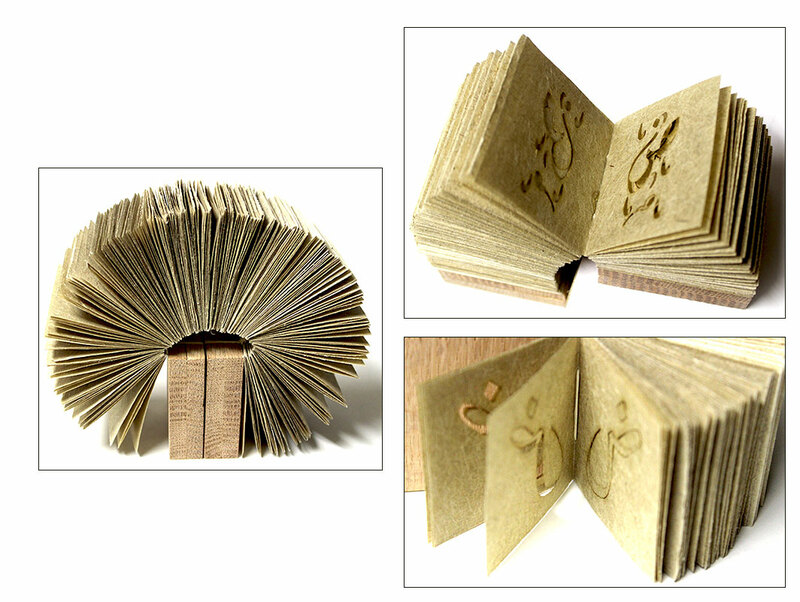 The book offers the reader with a different reality where the words describing the animals are not in the main book but inside the miniature books. The reader will be intrigued to find differences and connections between images and words, animal and human characters. The book ends with George Orwell's quotation: 'All animals are equal, but some animals are more equal than others.'" Cedar Falls, Iowa: Islam Aly, 2017. Edition of 30. 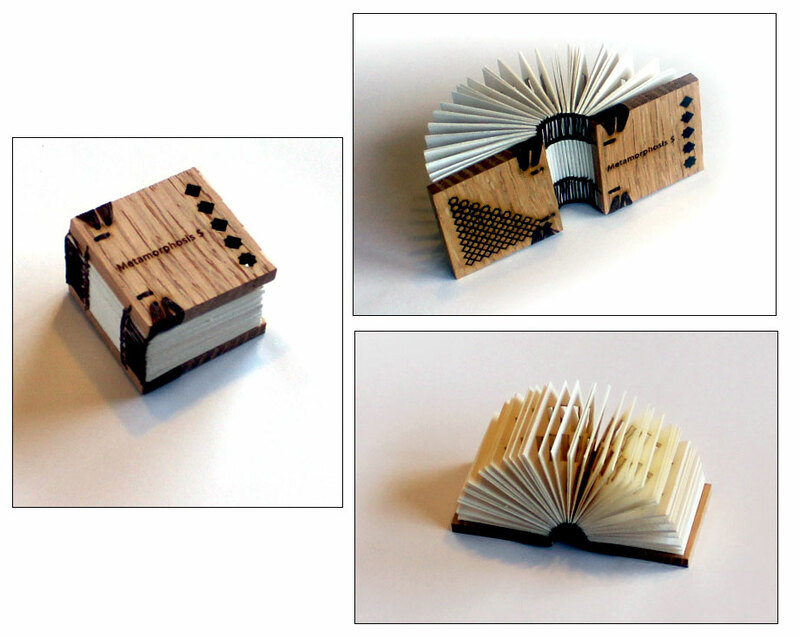 2 x 2 x 1.5" miniature book. Laser-cut mould-made Johannot paper. Twenty sections of 2 folios per section. 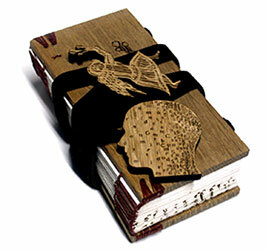 Handbound in laser cut and engraved wooden boards with Coptic binding of linen thread. Signed and numbered by the artist. Islam Aly: "In the Metamorphoses series, I am focusing on Islamic art and design. I want to reveal how patterns develop and morph in a book that makes the viewer experience their beauty, elegance, harmony, intricacy, and complexity. "Metamorphoses 5 represents a square that morphs into a star. The patterns in the book are combined, duplicated, interlaced, and arranged in multiple combinations that are precise, beautiful, and symbolic." 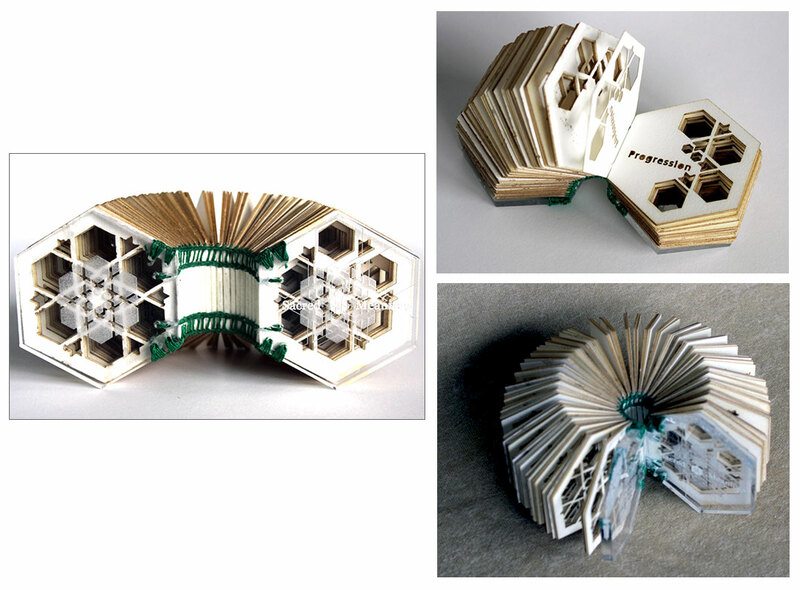 2.5 x 2.5 x 2.5" hexagon-shaped miniature book. Laser cut mould-made Johannot paper. Twenty sections of 4 folios per section. 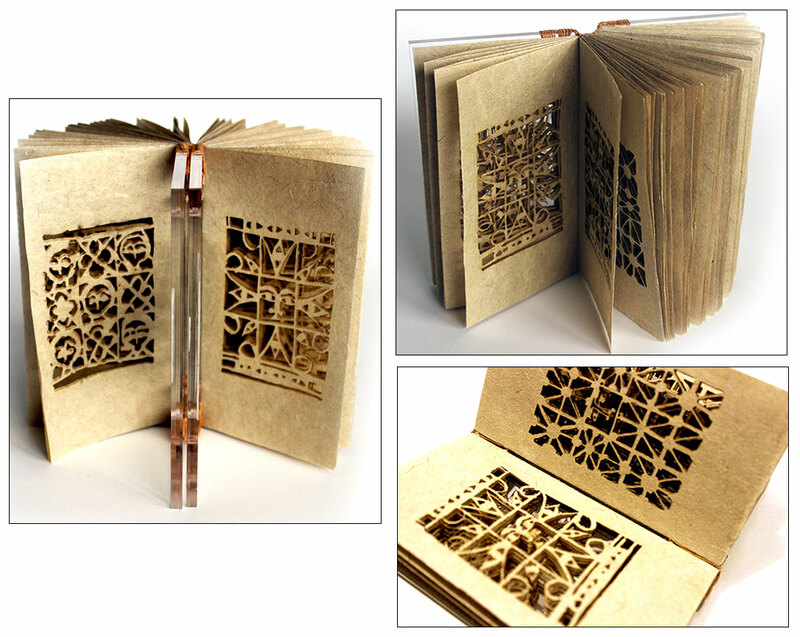 Handbound in laser-engraved plexiglass covers with Coptic binding of linen thread. Signed and numbered by the artist. Islam Aly: "Sacred Meanings is based on the hexagon, one of the main shapes in creating grids and patterns in Islamic art. The form of the book, its words, and its progression reveals the fading and development of a pattern. The book invites viewers to consider their experiences with the transcendent and indivisible. Sacred Meanings presents an encounter that deals with the dichotomies of life, fall and rise, suspicion and faith, disorientation and orientation, chaos and order." 3 x 6 x 2"; 15 sections with three folios. 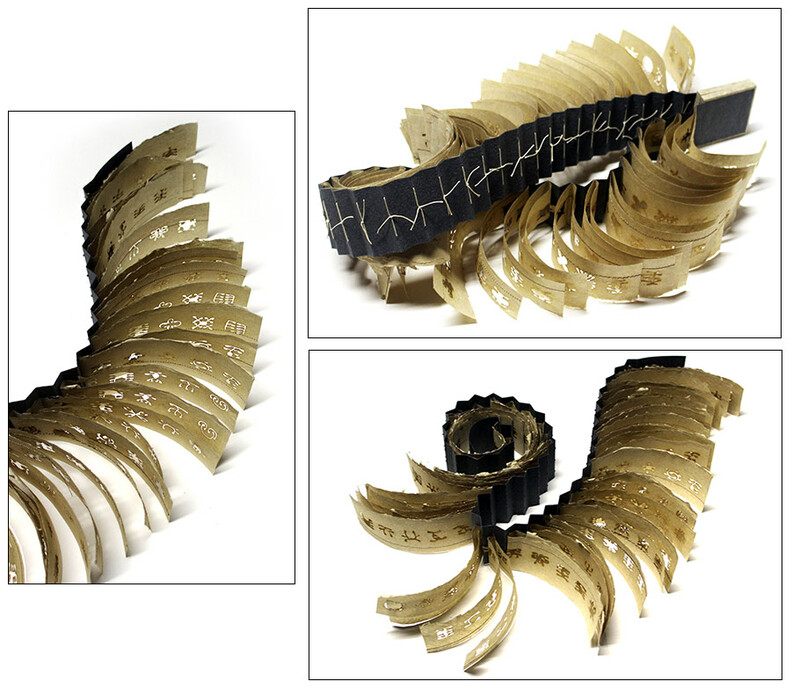 Materials: laser-cut mould-made Johannot paper; laser-engraved wooden boards; leather straps. Coptic binding with leather wrapping bands and wooden clasps. Signed, numbered, and dated by the artist. Islam Aly: "Unleash records an angel's attempt to leave the book. A journey that starts with words about being confined and restrained, the angel appears and slowly makes a path through these words until succeeding to break the phrases and get out of the book. When the angel disappears from the book, the letters of the broken words start forming a human face. 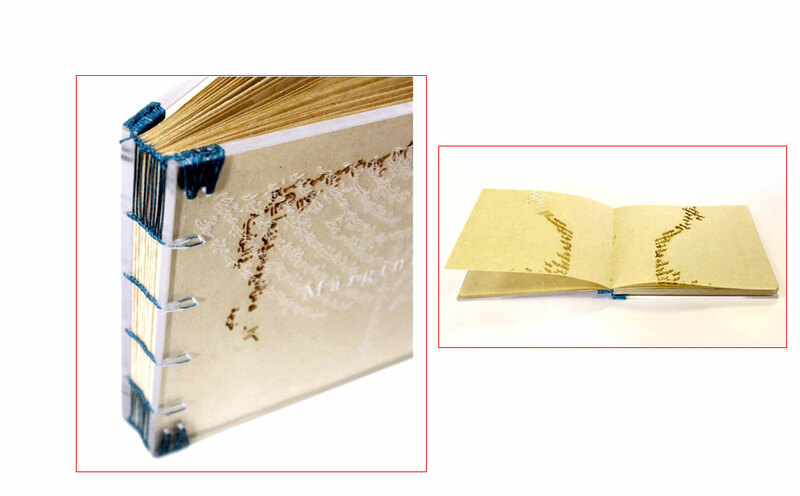 "By using a late Coptic binding with straps and clasps, the book structure echoes its content. One wrap has the angel on the wooden clasp; the other wrap has the human face." Cedar Falls, Iowa: Islam Aly, 2016. Edition of 30. 3 x 5.5"; 10 sections. Laser cut. Materials: handmade flax paper; Plexiglas; linen thread. Bound in Plexiglas boards with titles laser engraved in white on front board. Signed, dated, and numbered by the artist. 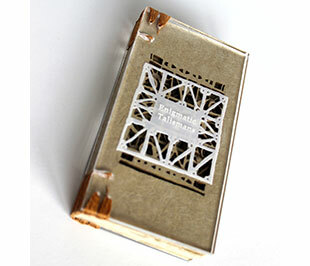 Islam Aly: "Enigmatic Talismans is inspired from the symbols found in Ethiopian healing scrolls. Originally they were produced to provide live spiritual power in the physical world. "I find the various symbols captivating, fantastic creatures, faces, eyes, angels, and patterns that blur the line between traditional function and contemporary abstraction. "The paper is made from flax paper with deckle edges to have the appearance and texture of the parchment that was historically used in the Ethiopian scrolls. The covers are made from transparent Plexiglas that reveals the overlapping symbols, generating new meanings." Cedar Falls, Iowa: Islam Aly, 2015. Edition of 40. 4.25 x 5.25 x 1" closed, extends to 20"; seven folds with two sets of six flags. Accordion flag book. Laser cut. Materials: handmade flax paper and Cave Paper; binders board; clear acetate; linen thread. Paper-covered boards with paper title on front board. Singed, dated, and numbered by the artist. "Metamorphoses 1 celebrates the growth and morph of a small star pattern. The geometric pattern can be equally thought of as both art and science. The pattern is based on the intersection of two equal squares. The patterns then are combined, duplicated, interlaced, and arranged in intricate combinations that are mathematically precise, aesthetically pleasing, and symbolic." Iowa City, Iowa: Islam Aly, 2014. Edition of 30. 2.6 x 2.6 x 3"; 30 sections with three folios. Mould-made Johannot paper. Colored and laser-engraved edges. Bound in laser-etched plexi glass. Two needle Coptic sewing and Coptic end bands with linen thread. 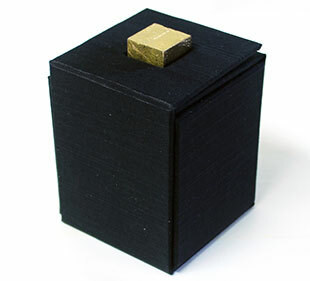 Presented in a folding box with gilded wooden cube and magnetic closure. Box dimensions closed: 3.25 x 3.25 x 4". Signed by the artist. Islam Aly: "This book is inspired by The Kaaba, a cuboid building at the center of Islam's most sacred mosque, in Mecca, Saudi Arabia. It is the most sacred point within this most sacred mosque, making it the most sacred location in Islam. Wherever they are in the world, Muslims are expected to face the Kaaba when performing prayers. In addition one of the Five Pillars of Islam, every Muslim is required to perform the hajj pilgrimage at least once in his or her lifetime, if one is able. Multiple parts of the hajj require pilgrims to make circumambulation seven times around the Kaaba. A tiny black cube is positioned at the center of the inner back board, around which are concentric circles cut in the thirty sections of the book to reflect the process of circumambulation." Iowa City, Iowa: Islam Aly, 2014. Edition of 40. 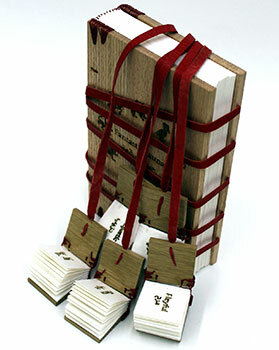 4.5 x 4.5 x 2.5"; 20 sections with four folios. Mould-made Johannot paper. Colored and laser engraved edges. Bound in lase- etched wooden boards. 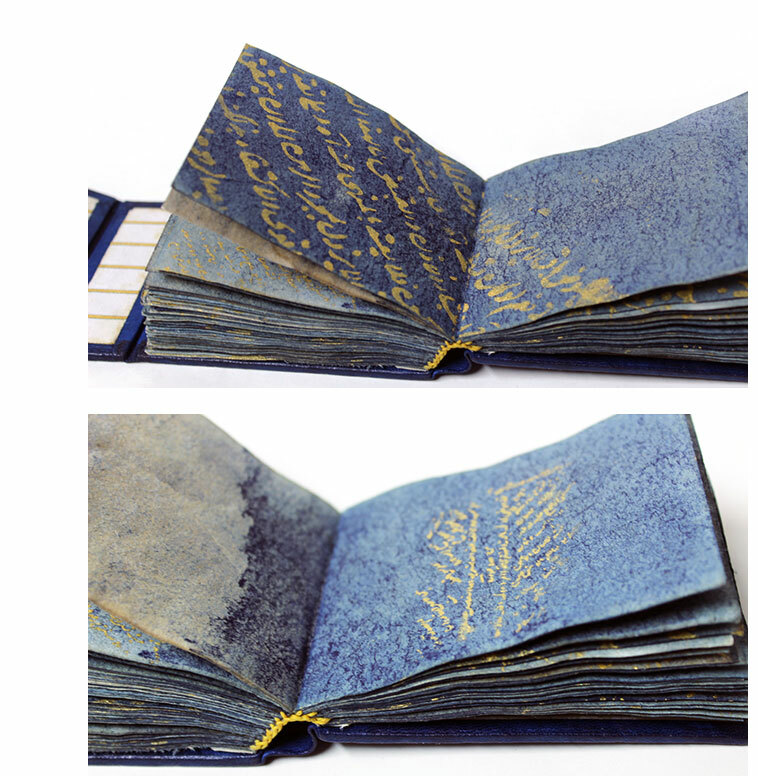 Ethiopian and Coptic binding with linen thread. Signed by the artist. Islam Aly: "Egyptian uprising called for democratic reform. Tahrir Square in Cairo became the focal point and the most effective symbol of the protests in January and February 2011. For 18 days Egyptians repeated the slogan: The People Want to Bring down the Regime (al-sha`b yurid isqat al-nizam) until the regime stepped down on the 11th of February 2011. "This book focuses on the revolution slogan 'al-sha`b yurid isqat al-nizam.' Using Arabic Kufic script the words of the slogan are repeated in an ascending sequence. Section 19 contains the English translation for the slogan 'The People Want to Bring down the Regime.' The last section contains the time and date when the regime stepped down along with the sentence 'Al Saa'b Askat al Nezam' with its English translation 'The People have Brought down the Regime'. "Cairo's map is laser engraved on the book covers. 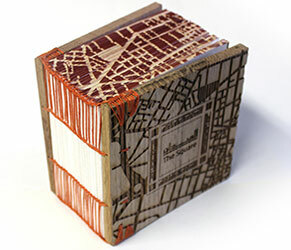 Three edges of the book are colored then laser engraved to show the streets of Cairo." Iowa City, Iowa: Islam Aly, 2013. Edition of 40. 5 x 5.7 x 0.7" (40" extended), 28 folios. 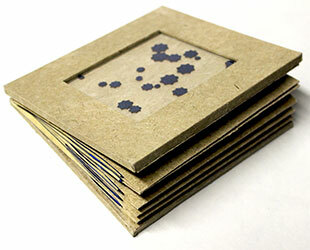 Laser-cut handmade flax paper. Three hole pamphlet binding in an accordion binding. Linen thread, handmade paper covers. 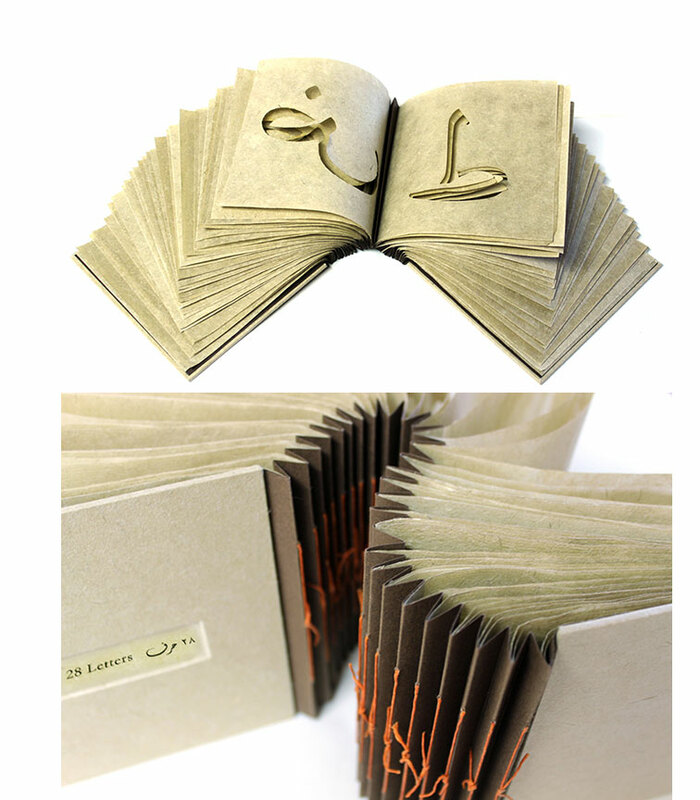 Islam Aly: "This book displays the 28 letters of the Arabic alphabet; each letter is laser-cut on a folio. 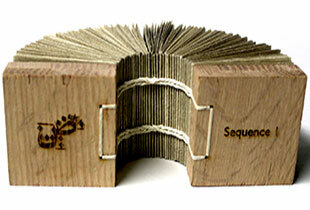 The accordion binding allows the viewer to explore and interact with the letters." Iowa City, Iowa: Islam Aly, 2013. Edition of 20. 2.8 x 3 x 3.5"; 400 pages. Mould-made Johannot paper. Laser engraved edges. Bound in embossed leather boards with coptic and Ethiopian binding techniques. Signed and numbered by the artist. between what's inside a book and what's outside. The book has no text or images on its folios. When the book is closed, the viewer can see the content on three edges of the book, but depending on how the book is opened some of the content on the edges diffuses and becomes illegible, converting into traces of texture." "Crucial Perimeter is mainly about the beauty of the Arabic calligraphy, what you see on the covers and the edges are not words but rather letters written in Arabic calligraphy, the dots are used as a measuring unit , for example a letter would be seven dots long and two dots wide somehow similar to the x height used in western typography. "The texts of marginalia came from old Arabic manuscripts again I was interested in these because of the beauty of the calligraphy and layout." 2 x 2 x 3.5"; 40 sections of 8 leaves. Laser cut. Materials: handmade flax paper, linen thread. Bound in laser-engraved wooden boards. Greek binding. Signed and numbered by the artist. Islam Aly: "This book is an exploration of one Arabic letter "Da d"; this is a very unique letter in the Arabic language because of its extremely unusual sound. Early Arabic grammarians described Arabic as the 'language of the ?? d', since the sound was thought to be unique to Arabic. "40 different shapes of letter ?? 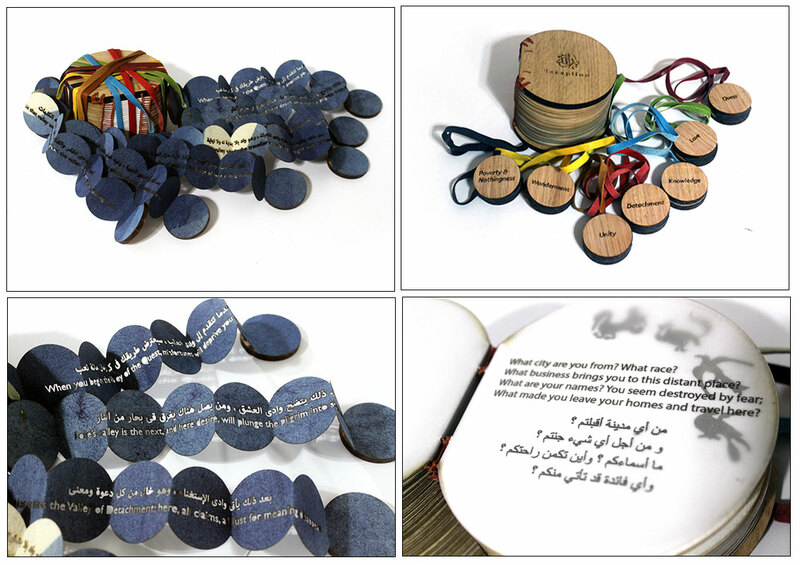 d are displayed in the book; each letter is laser-cut on a section of the book, for example, the very early Kufic scripts, the different styles of Arabic calligraphy, as well as multiple forms of fonts." Iowa City, Iowa: Islam Aly, 2014. Edition of 15. 2.8 x 3 x 3.5"; 30 sections with four folios. Mould-made Johannot paper. Laser engraved edges. Bound in laser etched wooden boards. 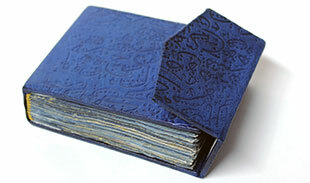 Ethiopian and coptic binding with linen thread. Signed by the artist. Islam Aly: "I made this book to document the words that were repeated in the streets of Cairo during the Egyptian Spring of 2011 when millions of protesters from a variety of socioeconomic and religious backgrounds demanded the overthrow of the regime. The people repeated the three words: Bread [livelihood], Freedom, and Social Justice. I used Arabic Kufic script and spelled the words Eish, Horeya, Adala Egtemaeya - Bread, Freedom and Social Justice. These words are repeated over and over in different ways along the 30 sections. The book is an effort to remember and reflect on these events. It also serves as a reminder for the revolution's main demands. 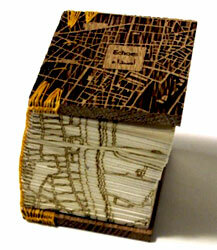 Additionally, the book incorporates details of Cairo's streets on the front and backboards. Cairo's map is also laser engraved on three edges of the book." Iowa City, Iowa: Islam Aly, 2013. One-of-a-Kind. 4 x 8 x 1"; 48 leaves. Hand drawing with water based ink pens. Hand paper cutting. Handmade flax paper. 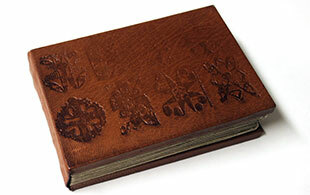 Ethiopian binding with embossed leather over boards.. Signed by the artist. Islam Aly: "Ethiopian Talismans were inspired from the Ethiopian healing symbols, believed to heal people both physically and emotionally. I used one symbol on each section. The shapes of the symbols inspired me to cut and color each page in a unique way. The paper is made from over-beaten flax paper with deckle edges to have the appearance and texture of the parchment that was historically used in the Ethiopian books." 6 x 8"; 60 pages. Arabic calligraphy. Laser cut text. Handmade flax paper. 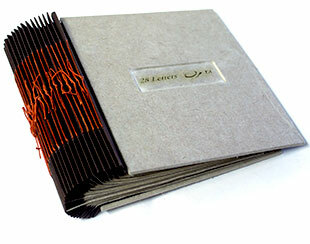 Coptic and Ethiopian binding with Plexiglas covers. Signed by the artist. Islam Aly: "The design of Marginalia 1 is inspired from Arabic commentaries that were written in different books. These commentaries have a unique shape, and layout. It usually would contrast with the geometrical design of the page. The commentaries played an important role in the transmission and transformation of knowledge. I wanted to show the beauty of their calligraphy on the handmade flax paper. I selected ten different pages for each of the ten sections. I used the laser cutter to cut each section and engrave the front cover. 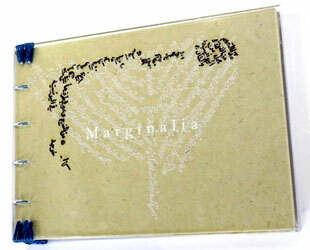 The sections were attached to the Plexiglas covers and sewn together using a two needle Coptic link stitch. Finally I sewed the end bands." 3.2 x 4.3 x 1.3 "; 10 sections with four folios. Handmade dyed flax paper. Pochoir, two needle Coptic sewing. 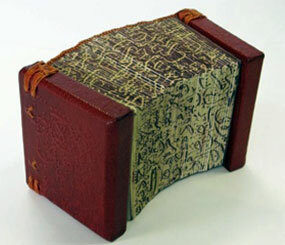 Leather-covered embossed Islamic binding. Signed by the artist. Islam Aly: "The design of Marginalia-2 is inspired from Arabic commentaries that were written in different books. These commentaries have a unique shape, and layout. It usually would contrast with the geometrical design of the page. The commentaries played an important role in the transmission and transformation of knowledge. I wanted to show the beauty of their calligraphy on the handmade flax paper. I choose different parts of these commentaries and started repeating them on the page."